Home VB STARS Russian perspectives on Social Media in Banking: Having the Right Conversation. 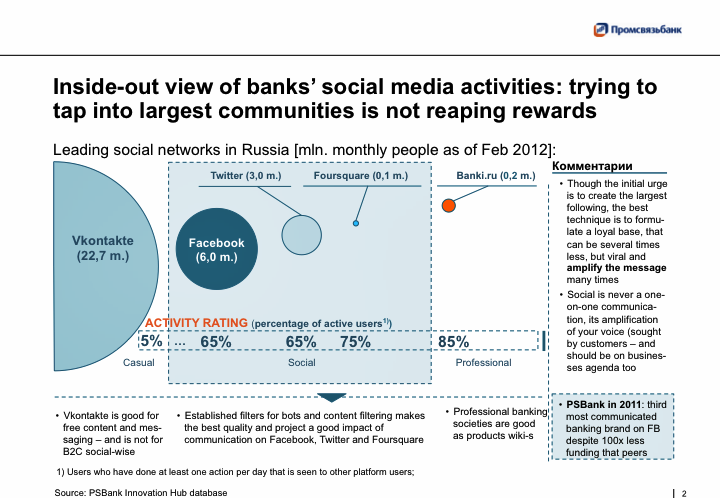 Russian perspectives on Social Media in Banking: Having the Right Conversation. In his guest post, Daniel Gusev – Head of Innovation at PSBank shares his views on Social Media in the Russian banking industry, and the (wrong) types of conversations banks currently have. As mentioned in my recent post covering my interview with Daniel , I am delighted to officially announce that he joined our new ‘Visible Banking Stars‘ programme, so expect to read many more articles here on innovation in the Russian banking industry from now on. I invite you to read Daniel’s very first contribution as a Visible Banking Star on the topic of digital engagement and the right type of social media activity. Russia is one of the worlds leading markets for social media platforms, people spend good time just messaging, commenting and liking things on their profiles – they are just as likely to first look up for information before making a decision on buying something, or selecting a bank to get / give money. And as since social platofms are so natural in bringing and voicing opinion, there are natural beacons for russian banks to leverage social media and open their virtual branches. But there are caveats: (1) on choosing the right platform and KPIs for being there and (2) on doing the conversation part correctly. There is a common belief that being on the most popular platform is the best strategy as you’d have more chances for geting the right number of users for the platform to take off. Wrong if you would only rely on popularity and not on communication amplification ratio. When first researching Russia’s leading platofrms we looked not at the total number of users, but at both habitual preferences of these users and the chances individual users were ready to interact with us. That instantly killed several platforms and saved us good resources to manage elsewhere. Looking at how platforms interlock is also a great technique – whether they offer Open IDs, fit into customer experince of consuming one type of content through what service, that all results into well planned pilots. Amplification should be seamless – and that creates several times more the effect if placed on a big community with disengaged users. It also raises the potential to grow a loyal fan-base that then would support the bank’s products rollouts. Next articleBanques et Réseaux Sociaux: Pas Assez de Convergence?